You want straight teeth, but you don’t want to wear metal brackets and wires for two years or more. We understand. If you’re considering clear braces, you’ve probably heard a thing or two about Invisalign. The treatment recently reached the 4 million mark — that’s the number of patients worldwide who have achieved straight teeth and confident smiles thanks to Invisalign. Take some time to learn about the treatment, how it works, and whether or not it’s right for you from your dentist in Westfield. 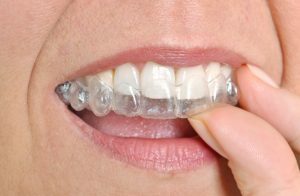 Invisalign uses clear plastic trays to gradually shift your teeth into better alignment. Each aligner is customized to place pressure on a different area of the teeth, according to your unique treatment plan. You wear each tray for approximately two weeks before advancing to the next in the series, gradually progressing through the treatment on your way to straighter, more beautiful teeth. The benefits of Invisalign are numerous. There’s the clearest difference, of course — the fact that Invisalign is practically invisible. In fact, chances are good that many people will never notice you’re undergoing orthodontic treatment. And because the Invisalign trays are removable, you can subtly slip them out before meals and important meetings. Removability also means brushing and flossing is just as easy as ever, so you don’t have to worry about your dental health suffering throughout your orthodontic treatment. What’s it like to live with Invisalign? Once you get used to your clear braces, you’ll find it’s not so different from what you’re already used to. Wear your trays for 20 to 22 hours each day, removing them before snacks, meals, and to brush and floss at night and in the morning. Rinse your aligners and brush your teeth before reinserting the trays. Make sure you continue to brush your teeth for a full two minutes each time, and floss at least once daily. Keep up with your regularly scheduled checkups at the dentist’s office, where we’ll make sure everything is progressing as it should with your clear braces. So, living with Invisalign? Not so difficult after all. The length of your Invisalign treatment depends on the severity of your misalignment. Some cases are completed in just a few months, but the average adult treatment lasts one year. It’s important to have healthy teeth and gums throughout your time with braces, so you’ll first undergo a checkup and cleaning before receiving Invisalign. Instances of tooth decay or infection should be corrected before or alongside your orthodontic treatment. Are you ready to straighten your teeth with clear braces? If so, it’s time for you to learn more about Invisalign in Westfield. Contact our office to schedule an appointment today.